Costco Soulmate Trading Outlet | Top Quality Soulmates at warehouse prices: two for the price of one! 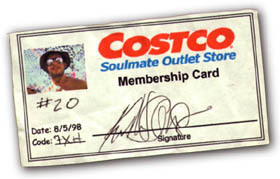 The Costco Soulmate Trading Outlet is a membership-only store. Membership applications are available at all locations, including our main Black Rock City store location. To qualify for membership, customers must bring a “Soulmate-Compatible” friend to trade. “This keeps our inventory in balance,” stated CEO Emeritus Rico. There are no other membership fees, but this is negotiable. We are always willing to accept food, massage, good stories, magic tricks, cocktails with funny names, and ballpoint pens. Membership applications consist of a completed questionnaire personally designed to embarrass and humble each applicant. Applicants are asked to attend a membership interview where their soulmate eligibility will be assessed. At the end of the interview, a membership card will be issued. After a membership card is issued, members may pick up their soulmate after an hour or more. Members will be issued information about their new soulmate, another resident of Black Rock City. Unlike other soulmate chains, the Costco Soulmate Trading Outlet keeps costs low by eliminating charges associated with stocking and delivery. “Rather than delivering soulmates,” said Rico, “we tell customers where they can find their soulmate, and they track them down.” We refuse to be undersold, and that’s why Costco offers TWO soulmates for the cost of one. Act now, and when you receive one soulmate to track down, another soulmate will receive your information to track you down.